Rory O’Shea Was Here is one of those bulletproof movies that tries to be so uplifting that only a grump would dare publicly give it a bad review. Call me Mr. Grump. 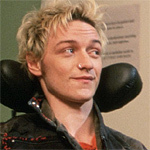 Rory (James McAvoy) has muscular dystrophy, which has left him with control of two fingers and his big fat mouth. His carefully disheveled hair, pierced nose, and otherwise handsome appearance tell you at a glance all you need to know about his character. He’s a “rebel,” but mostly on the surface. He enters a home for other wheelchair-bound patients. Notably among them is Michael (Steven Robertson), who has cerebral palsy. Michael, too, is summed up neatly in his first appearance. The straight-laced trim haircut and Mister Rogers sweaters he wears reveal the square nice guy underneath. Rory and Michael are an unlikely pair, which makes them perfect for this “uplifting” comedy/drama. They become compatriots when Rory proves to have an amazing knack for understanding the speech of Michael, hindered as it is by his condition. Michael seems thrilled to have somebody understand him, and Rory is happy to have a Milhouse to kick around. Besides, Michael has the use of his hands, and can do Rory’s hair every morning. Naturally, they get into trouble. Naturally, Rory is assumed to be the instigator and blamed for their absence. Naturally, Michael sticks up for Rory, and the two become even closer friends. The movie continues in this vein while Michael and Rory move out of the house and find their own floor-level apartment. They hire another pretty girl (Romola Garai), blond, with a big pair of ... eyes to be their nurse. Rory O’Shea Was Here is a very nice movie. It succeeds at what it tries to do. The problem is that it doesn’t try to do anything fresh or original. The fact that our two friends are wheelchair bound is supposed to carry the movie, and it just can’t. Maybe in another time, when MD and CP were taboo diseases that nobody talked about, the movie would be an eye opener. But that isn’t the case. Nobody will be shocked to learn people with CP are people too. And once you get past that “revelation,” there’s nothing left except following the cliched plot to it to its button-pushing conclusion.